The Maharashtrian cuisine – unlike it’s rich brother-and-sister cuisines across India – is more utilitarian, efficient and on-the-go. While the rest-of-India has given us long, patient, at times overnight preparations like Daal-baati-churma, Samosa-chat, Dosa-chutney-sambar, Kababs, Khubani-ka-meetha etc etc. the Maharashtrians have come up with the quicker, staple versions like peethla, usal and thalipeeth . The four pillars of daily Marathi food – the Vada Pav, Pav-Bhaji, Misal-pav and Kanda-pohe – have all something in common. They work as round-the-clock dishes and do not need any side-dish. It is really commendable that this year the Maharashtrian dish “Misal-Pav” won the IFN award for best vegetarian dish. That would understandably surprise many, because they haven’t heard of it let alone tasting. It is common man’s staple food, away from any celebrity status. It doesn’t enjoy the fame of tandoori-chicken, the flamboyance of Navaratan Kurma, richness of Kashmiri Pulav or Kesar-badam-kheer. It’s rather a red, angry looking dish. Nobody would invite it for some shahi-dawat or 5-star banquets. It rather waits in small, humble road side eat-outs and thus is largely unheard of. But there are many gems in the pockets of Indian cuisine which are unheard of. Or to paraphrase it per the modern social norms, there are many culinary gems inside deep pockets of “Bharat”, which the “India” is unaware of. Take for example the Benne (butter) Dosa of Davangere, Litti-chokha from Bihar-Jharkhand, Puttu-kadla curry (horse-gram curry) with banana from Kerala, Neer dosa from Mangalore and similarly the Misal-pav from Kolhapur. I am from Kolhapur. Like the wine lovers discuss wine from Champagne, Bordeaux, Chianti, Palatinate and so on; we Kolhapuri’s discuss the Misal of various local food joints like Ahaar, Khasbaug, Chorge, Fadtare, Bawada… with the same passion and earnestness. As a blogger and a native, I have both – an upper hand and moral obligation – to tell the readers a thing or two about this “best Indian vegetarian dish” – so that they can distinguish the original masterpieces from it’s substandard copies and relish the dish the way it’s meant to be. Here are some tips for the foodies. #Tip 1: Misal ka sachha saathi, Paav – Like a good base matters in case of Pizza or a good quality rice is a must for Pulao/Biryani; similarly the Paav (Bread) can make or break a Misal. 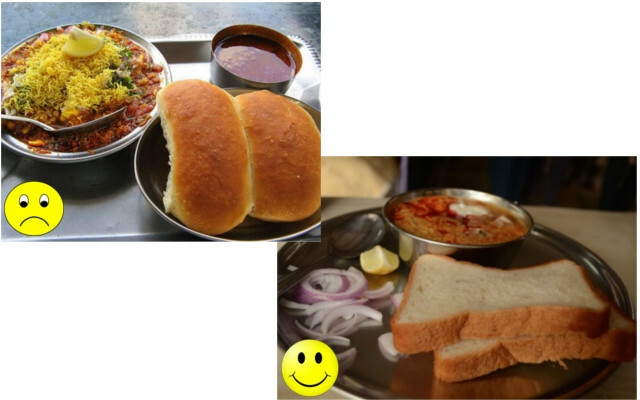 The first test of any Misal food-joint should be done with the kind of Paav they serve. If the Paav is the bun-paav, (like they serve with Paav-bhaji or vada-paav), know that something is wrong. Many well known eateries in Mumbai-Pune region serve bun-paav with Misal, but the bun-paav is not the ideal companion of Misal. 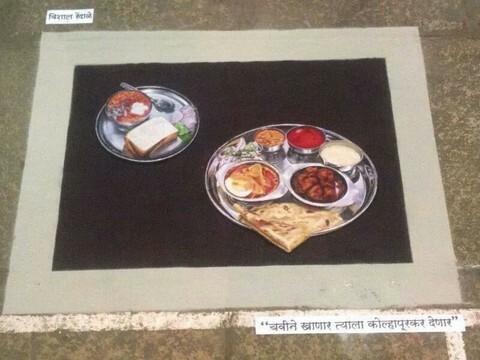 The ideal paav with Misal is known as saadha (plain) bread in Kolhapur region. It is somewhat over-fermented, hence more sour. It is without milk and any sweetness thereby. It also needs to be porous and soft, so that after dipping it can hold the liquid gravy like sponge. These bread slices should be served with Misal. Something like a bread-bun – which cannot be soaked thoroughly in Misal gravy – is not a good substitute. In the Kolhapur region, they don’t serve the side slices of the bread for the same reason. On a side note, if you live abroad and are trying the dish at home – try the Turkish flatbread with Misal. That’s the closest I have found to original Kolhapuri plain-bread. Never try it with sandwich bread or milk bread. The ardent followers of Misal cult are very particular about the type of Paav!!! #Tip 2: Just adding lot of chilli doesn’t mean Kolhapuri – This point is true for Misal as well as other Kolhapuri cuisines. Many restaurants make it red-hot unbearably spicy in the zeal of making it “assal” (authentic) Kolhapuri. I have known many poor souls who tried Kolhapuri dishes at wrong places and ended up with tongue blisters or upset stomach. The Kolhapuri cuisine relies on dry coconut, sesame and coriander to counterbalance the stomach burning effects of extra chilli. If you don’t feel these ingredients in the gravy, know that it’s not authentic. #Tip 3: Ek machali sare talab ko … – Misal is a tricky dish – after all making something hot spicy and at the same time enticing and desirable is not an easy job. Usage (or overuse) of couple of wrong ingredients can ruin it easily. The Misal uses mataki (moth beans) as it’s core ingredient. Again, there are many who mix in green-peas, green-gram or other sprouts. At the best this can be seen as improvisation, but certainly not the original recipe. Also tangy ingredients like Tomato or Curd are not part of the core recipe, though some use them. In my opinion the dish is better-off without them. I have, to my dismay, seen even Poha inside Misal, and I am not sure if that was some innovative idea of the maker or was just leftover from the previous night! Same applies to the Sev/Farsaan/Mixture that is used with it. A plain sev or plain mixture, tending somewhat to sweetness is the best accompaniment. Anything otherwise is not. So that’s that. If you happen to hear this news that some dish called Misal-Pav happened to be the best Indian vegetarian dish and you still haven’t tasted it, then don’t just rush to the nearest food joint to see what it’s like. Follow the three easy steps mentioned above and save yourself from disappointment :-). Or alternatively, if you happen to drive nearby Kolhapur then try it directly there – its’ like tasting pizza in Naples. दोस्त लेख फक्कड जमलाय. कोल्हापूरच्या http://www.smartdost.in/ स्मार्टदोस्तकडून शुभेच्छा. Interesting post about Misal Paav.Thanks for sharing. Ohhh I miss it a lot.. there are very less places in Bengaluru where we get this..